Now you can add pictures of your helicopter models to the gallery, with your own description. Please read the instructions carefully before submitting. 1. LF Models have issued a new version of their 1:72 Kellett YG-1. This time it comes as a KD-1B, #7246; resin, etched brass and white metal. 2. Another Academy re-issue this week from the 1:35 MRC range is the M.A.S.H Bell 47D, re-numbered #2194. 3. Navigator are planning to re-issue their resin 1:48 Mi-8 Hip in an upgraded form. We don't yet know what form the upgrade will take. 4. Czech Master's Kits #48053 will be a pair of 1:48 resin US Army helicopter crew figures from the Vietnam era. 5. The latest release from the Cobra Company is #35004, a resin correction and detail set for the Academy 1:35 UH-60L Black Hawk. This 8-piece set contains a full size stabilator, corrected engine inlets with engine face inserts, the side sponson/step extensions that account for vibration absorber installations, and the rear cabin wall with detail on the face. 6. A 1:72 resin, vacform, and etched kit of the Agusta A106 ASW is being prepared for sale later this year. 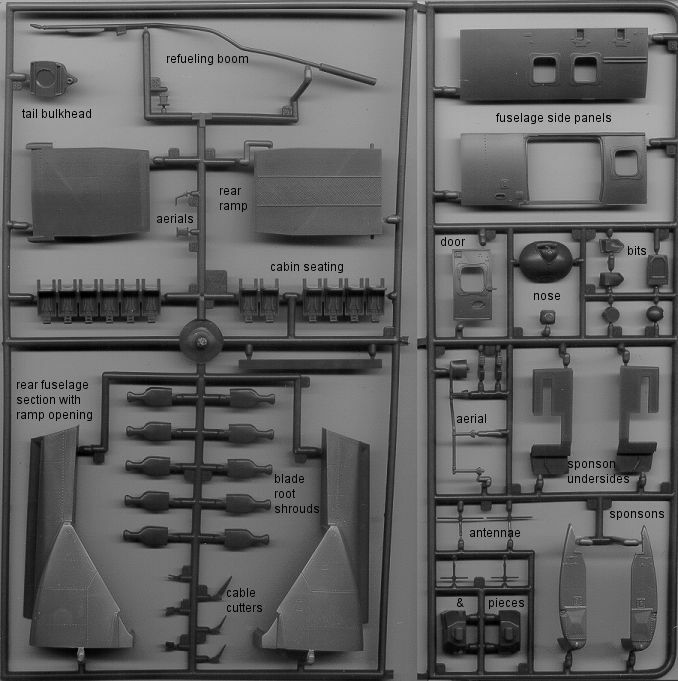 A pair of highly detailed Mk.44 torpedoes and the removable floats will either be included with the kit or sold as an extra set. At the moment all the major parts of the master model are ready. The one piece of missing information that's delaying the project is the shape and layout of the instrument panel. If any HKN reader has photos of, or access to, either of the A106 prototypes preserved in Italy, please contact the editor. The sooner we have this vital information, the sooner the kit can be released ! Other exciting new models are in preparation by the same maker. 7. Also due (later this year, we hope) are several 1:72 Sikorsky S-76 kits from a Czech manufacturer. Resin kits of the A, B, and C model variants are planned. 8. Eduard's 1:35 UH-60 Black Hawk detail sets are among their April releases. Don't be confused by the '32' series numbers - if you want to know why they did this, there's an explanation at their website. Also at the website are pictures of the frets and the instruction sheets, plus some close-ups of the parts applied to a model. #32-067 is the exterior set, while #32-068 is for the interior. It will be interesting to see how they do these variations, and what decals will be included. 10. 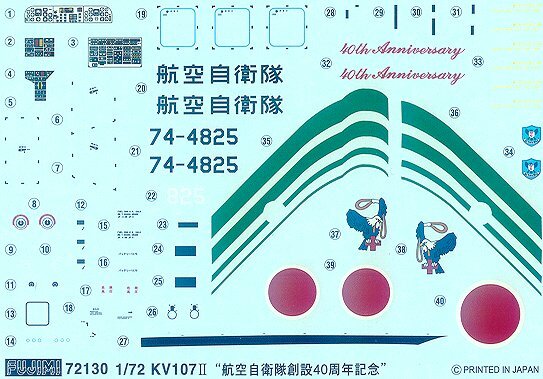 Fujimi's recently released special edition #72130 of their JASDF 1:72 KV-107II-5 in Hyakuri Rescue 40th Anniversary markings has the standard red/white/yellow/orange paint scheme, embelished by a series of diagonal green stripes and an eagle twirling a lassoo. 11. 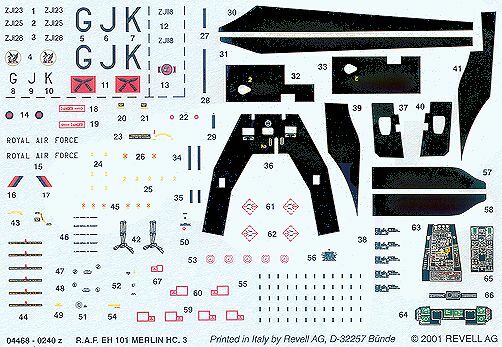 Here are the new sprue and the decals from Revell's RAF Merlin HC.3 #4468 as described in HKN #141. On a less positive note, Sanger Engineering appear to have abandoned the plans they had to follow their 1:72 vacform Mi-6 with other large Soviet models. Thanks to Philippe Dognon, Chris Miller (Cobra Company), Tony Morgan, and very special thanks to Martin Elcox.